You’ll see from the title of this post that I’ve actually named the piece. I thought ‘Cochineal Dream’ seemed right, and I added the ‘1’ because I felt motivated to create at least one more piece to make a mini-series. 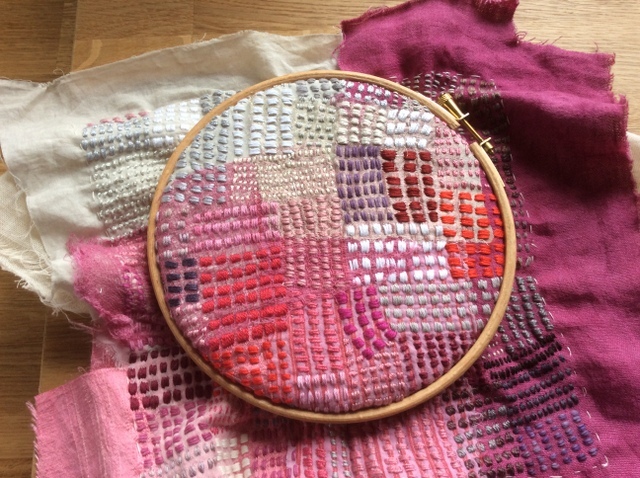 I keep having ideas about other things I can do with this particular approach to stitching, so I reckon I might as well continue with it for a bit longer. If I do make progress on this I will write more blogposts about it. 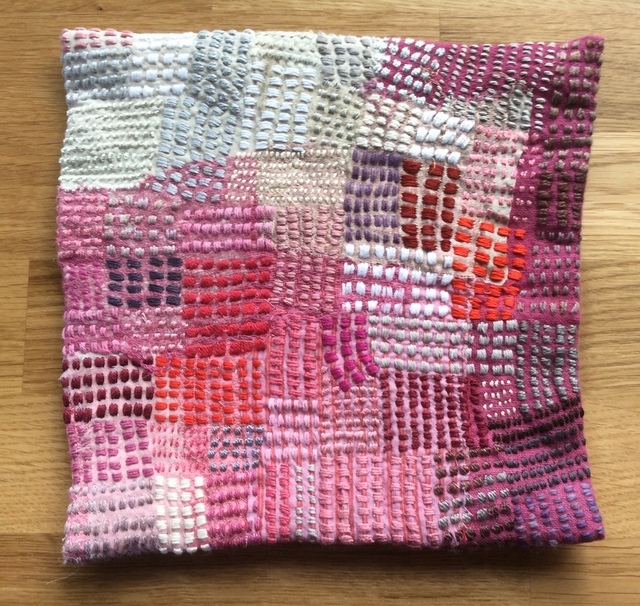 I’ve read textile artists on the subject of working in a series; Lisa Call even has a course on it, and it seems to be generally regarded as a good thing to do. It seems to me it does make sense to be able to present, and to refer to, a coherent body of work, so I’m by no means averse to moving in this direction. But, at the same time, I have lots of other, different, ideas that I’d like to explore if only I had time. They can put that on my tombstone: ‘….. if only she’d had time….’. I’ve been doing some more dyeing recently, and have been very absorbed in it. 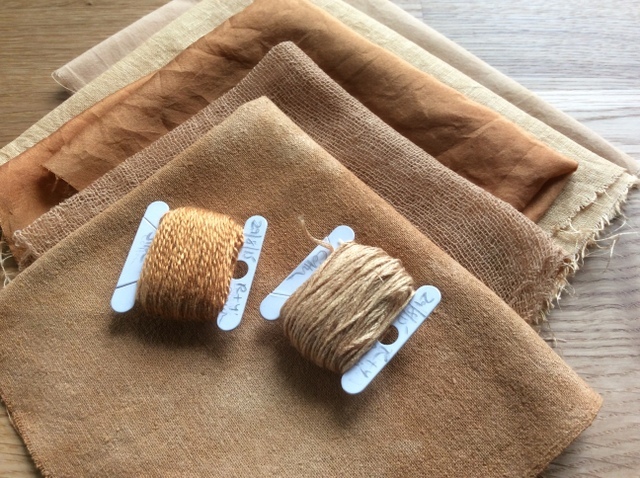 We’re having a few days of a kind of Indian summer at the moment, and this is a good time to be hanging cloths and threads out to dye. When I get it all organised, ironed and the threads untangled and wound I’ll no doubt write something more about it. I’ve decided to use Amazon less from now on, and will try to use other sites for ordering books and media. What’s prompted this? Well, a few weeks ago there was an article in the New York Times about Amazon’s working practices which are really repellent. The working environment is aggressive and employees are monitored constantly. Little, if any, concession is made to major life events such as having a baby, getting ill, your nearest and dearest being ill etc. And they use an annual system of performance review colloquially known as ‘rank and yank’, where the people who are perceived as the poorest performers are sacked each year. The late, unlamented, Enron used the same system, as did General Electric. GE subsequently dropped it. It’s neither an efficient nor an effective way of managing staff; it ensures that people spend far too much time on internal politics, jostling for position and Machiavellian manoeuvres to stay in a job/get somebody else chucked out of their job. I’ve read disturbing things previously about Amazon’s working practices, but this was the one that tipped the balance for me. Amazon has grown so huge and omnipresent that it’s difficult to avoid, and I’m not making a complete commitment to avoiding it in future. I’m working on a project to self-publish and although I’m happy to do so via Kobo, I think I will have to at least consider using Amazon as well because it’s just so ubiquitous. However, I will aim to use other sources for purchasing where at all possible. My recent book orders have gone to Bookdepository. The books are slightly more expensive (although once you take their free postage commitment into account, the difference isn’t that great), and they take a little longer to arrive. But I think these are minor drawbacks, and it’s important to take some kind of a stand on this. Until recently, when writing this blog, I’ve linked to Amazon whenever I’ve mentioned a book. But no longer – the last couple of links have been to Bookdepository, and I will aim to spread the links around a bit to other sites. OK, it’s not that big a deal. It’s not like gazillions of people read this blog and are likely to be influenced. But still…..
You’ll see that I put quite a lot of white and grey into it. Just because I felt like it. When I started this piece I wanted to get some pink and red contrasts (cool contrasted with warm reds and pinks) but didn’t have much clear idea other than that where I was going with it. 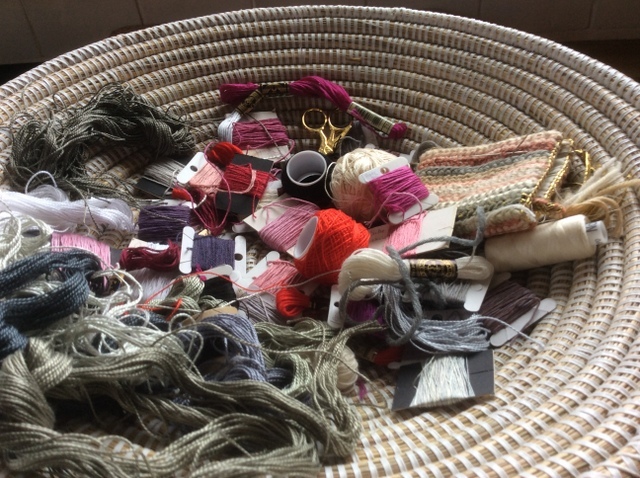 I collected together various threads that I thought might work together and then just picked them out to use as I felt like it. This is fine in a sample piece. However, I think the next stage with this is to experiment with composition a bit more, so that the principal shapes and lines in the piece are more planned. I may also experiment with using line more, rather than working the colour in blocks. 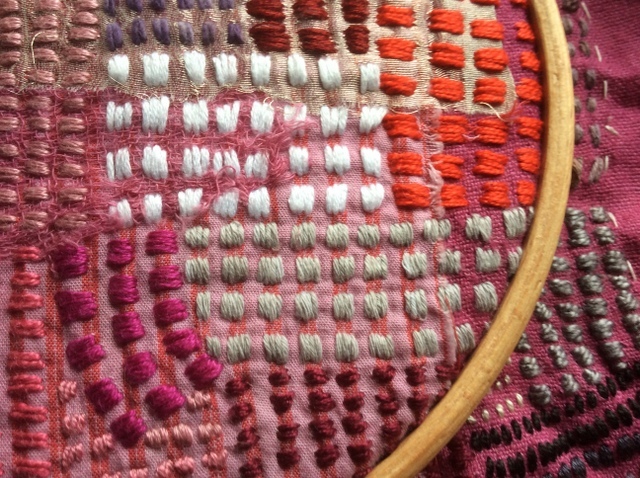 First, though, I’ll get this sample finished off, by backing it with something suitable and neatening the edges. I’ll post a photo of the finished piece once I’ve done this. 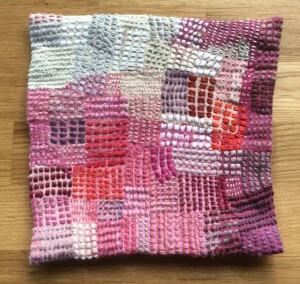 I’ve ordered a copy of Slow Stitch: Mindful and Contemplative Textile Art by Claire Wellesley-Smith. This was published a couple of weeks ago, and I’m very much looking forward to seeing it. Some readers may remember that I went on a course on natural dyeing with Claire a couple of years ago, and came away deeply impressed and very keen to try out natural dyeing techniques. If you haven’t come across it, Claire has a beautiful blog. She doesn’t update it as frequently as she once did (I can relate to that) but it’s well worth a look. And if you get the opportunity to go on one of her courses, drop everything and go. I’ll probably get round to writing a review of Claire’s book at some point, so look out for that. I thought it was time I got back to dyeing, as I haven’t done any for a while. This is partly because of other priorities, but also because a little dyed fabric goes a long way when you’re handstitching. You really don’t need that much of it. I’ve had occasional notions of perhaps trying to sell any surplus, maybe via Etsy, but I haven’t yet done anything about it. I’m probably too busy with work and household things to start even a small-scale commercial enterprise. And besides, I don’t have a clear idea of whether there’d be any demand for it. A prompt to get started again was reading about dyeing with avocado stones. A few weeks ago I bought a copy of ‘Quilting with a Modern Slant’ by Rachel May, in which there is a brief instructional section on dyeing using avocado stones. We don’t eat a lot of avocados, so it took me a while to save up half a dozen stones. 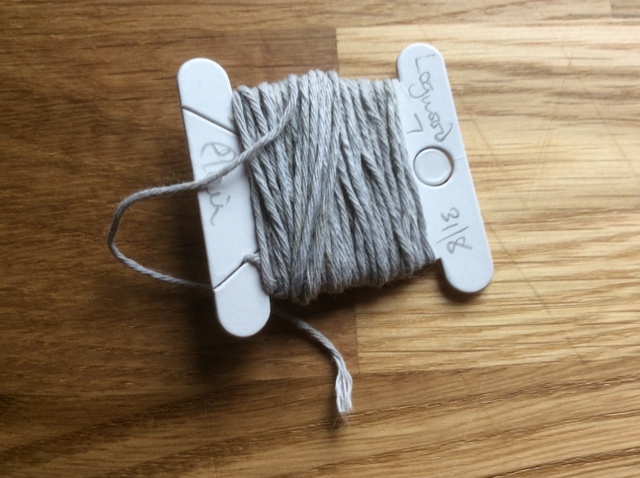 I followed the instructions, added the cloth…. and, well, it was disappointing. Maybe I didn’t boil them for long enough. Maybe they’re the wrong variety of avocados. 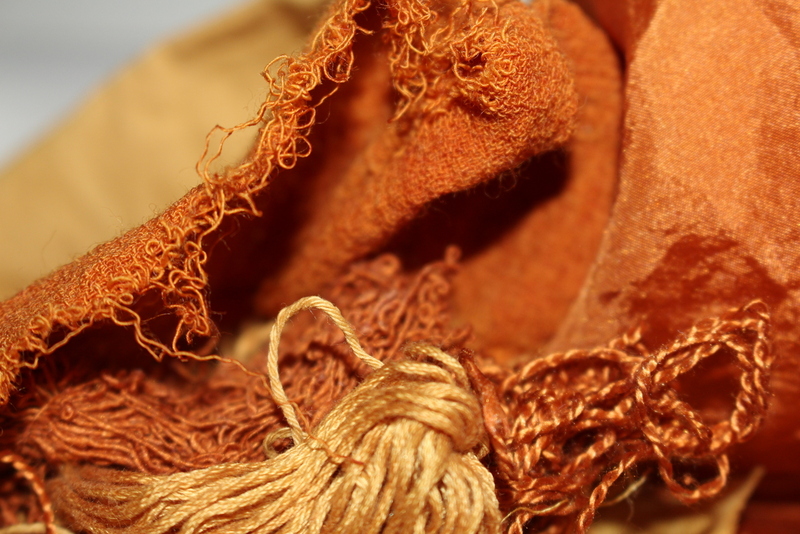 Whatever the reason, the fabric emerged very little changed from the way it went in to the dyebath. Avocado is supposed to produce great pinks and purples. Not for me. Both are lovely. Both add to my stock of colours and both are reproducible to at least some extent. What I need to do more of, now, is logwood dyeing as I’ve practically exhausted my range of greys. I’ll report back if and when I get round to it. In visual perception a color is almost never seen as it really is — as it physically is. This fact makes color the most relative medium in art. In order to use color effectively it is necessary to recognize that color deceives continually. To this end, the beginning is not a study of color systems. First, it should be learned that one and the same color evokes innumerable readings. Instead of mechanically applying or merely implying laws and rules of color harmony, distinct color effects are produced-through recognition of the interaction of color-by making, for instance, two very different colors look alike, or nearly alike. This looked, and still looks, to me like a pale, very neutral grey, oriented towards blue if anything. 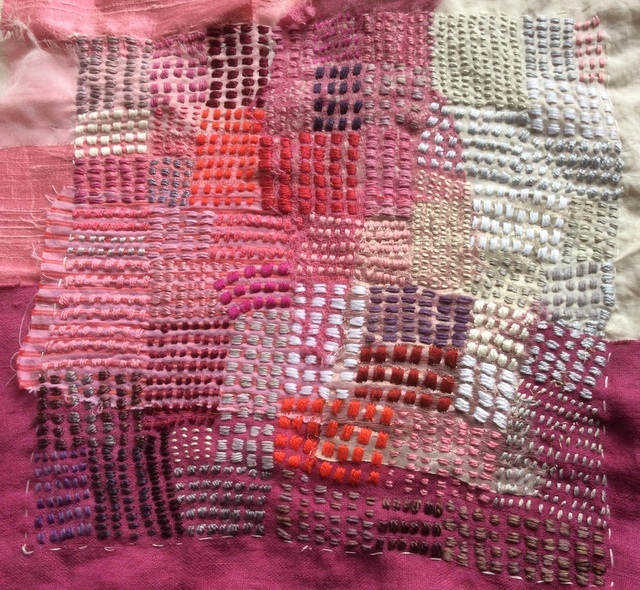 But when you put it in context up against all the pinks, its essential greenness emerges. The extent to which you will be able to see this (if at all) depends upon the monitor you’re viewing it on. I’m seeing this on a monitor that seems to leach the greenness out of the grey. I have two monitors in front of me, and when I move the images across to the other one, I can see the green much more clearly. 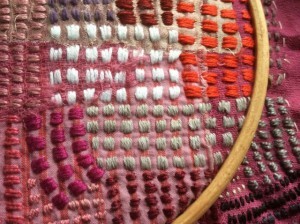 When I look at the actual piece and the thread, the difference is very striking to me. This is just another, very small, example of the weird wonderfulness of colour. I have been looking at colour for some years now, and I sometimes feel that I’ve barely started exploring it. Yes, it’s been a long absence from the blog. Sorry. Health problems, I’m afraid. I’ve had a couple of quite long drawn-out problems to contend with and I’m not quite sorted yet. However, the neck and back problem that cropped up again late in July is now largely vanquished, thanks to some excellent physiotherapy. Here in the UK you can get access to physiotherapy services on the NHS but I know that there’s typically a long wait. For readers outside the UK – the NHS can be absolutely wonderful. It’s a Very Good Thing and we should be proud to live in a civilized country that provides free access to healthcare for all. It’s also very cheap and efficient compared to healthcare provision in say, the USA or in some other parts of Europe. If you have a limb hanging by a thread or are in imminent danger of falling off your twig because of some vile disease, the NHS steps in and sort you out. It’s very good indeed for acute problems. Where it’s sometimes less impressive is for chronic problems. (And if you’re mentally ill you have little chance, because of budget cuts in recent years). Where I live (I think this is not the case in all areas) you can access private physiotherapy services quite readily by ringing up a clinic and making an appointment. So when I started getting serious pain in my upper back and neck I didn’t hesitate – I rang up the clinic straight away. The receptionist mourned the fact that she couldn’t provide me with a same-day appointment, but provided one for the following morning. I improved rapidly, but then at around a fortnight into the treatment I decided to award myself an afternoon off work to do some stitching. I’d not done any for a while because of the intense pain in my neck, but I thought it might be a good, relaxing, thing to do. Big mistake. No, HUGE mistake. By the following day my back was very much worse. I sloped off to see the physio and she asked me to detail for her all the activities I’d engaged in on the previous day. When I got to the stitching, she stopped me…’that’ll be it’, said she. And of course, I could tell she was right. So there was no more sewing for me for a while. I half-heartedly suggested that perhaps I could do some machine stitching but she vetoed that as well. However, all things must pass, and gradually I’ve got better. I was able to pick up my work for five or ten minutes and then gradually for longer periods. But I still have to be careful not to stay in the same position for too long. It’s preventing me getting really immersed in the work, unfortunately, but I suppose I’m just going to have to be sensible. Despite the physical problems, this has been a joy to work on. I love the pinks. I’ll write more about the piece next time.